"Remix compil" is a remastered version of the intro compil 1,2 & 3 by the Black Cats. 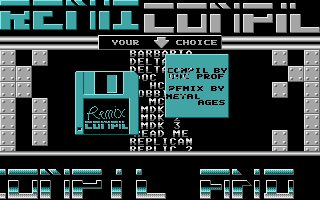 The three compils by the Black Cats were available on three 11 sectors double sided floppy disks. This content has been remixed on four 10 sectors double sided floppy disks (more reliable) with a menu at boot to select the screens. As there was space left on the fourth disk, we have put the First Age demo disk image with a writting program. when you have to perform reset in the intros that do not end correctly, use warm reset instead of cold reset. By this way the menu will remain on the last selected screen entry.